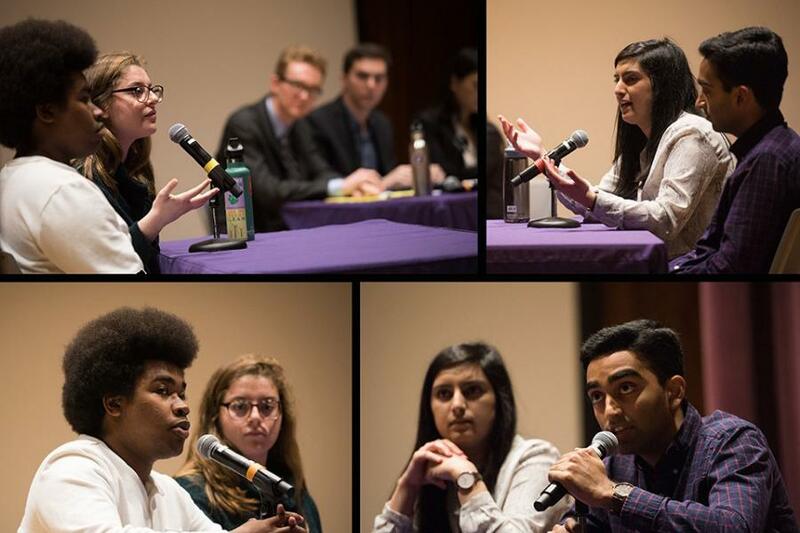 (Clockwise from bottom left) Executive vice presidential candidate Macs Vinson, presidential candidates Christina Cilento and Joji Syed and executive vice presidential candidate Archit Baskaran debate Wednesday. The debate, moderated by The Daily, was the last of three debates before students vote Thursday and Friday for Associated Student Government’s next top leaders. 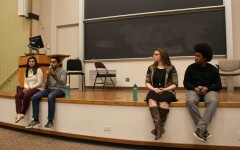 The two Associated Student Government presidential tickets faced off Wednesday in the last of three debates, discussing the role of student activism and collaboration with administration before more than 100 students in McCormick Auditorium one day before students vote. 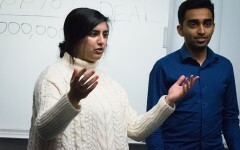 SESP junior Christina Cilento and her running mate, McCormick junior Macs Vinson, promised to change campus policy by putting pressure on administrators with protests if necessary, while Weinberg junior Joji Syed and her running mate, Weinberg sophomore Archit Baskaran, pledged to change campus by working with administrators. During the debate, which was moderated by The Daily, each candidate except Baskaran said he or she attended a dinner at University President Morton Schapiro’s house the night before. However, Cilento and Vinson said they walked out because Schapiro had not done enough to address the demands of divestment campaigns. When they walked out of the dinner, student protestors were outside demanding divestment from coal companies, corporations they say violate Palestinian human rights and corporations they say promote mass incarceration. Syed said she stayed at the dinner because, as a representative of the student government, she believes she must have a “working relationship” with administrators to effect change. Student pushback against policies with which they disagree is still possible while maintaining a respectful relationship, she said. The debate grew briefly heated when the tickets were asked to differentiate their campaigns and both reaffirmed their commitment to serving marginalized students. Cilento said her campaign focuses on issues of mental health that are similar to those of the opposing ticket, but look at them through a different lens, saying their own campaign focuses specifically on marginalized students. Vinson said focusing their campaign on marginalized students would help everyone. Earlier in the debate, each side was asked to name an aspect of the other’s platform they agreed with and would try to implement during their term. 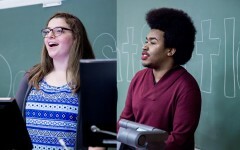 Baskaran said he liked the other ticket’s idea of adding gender-neutral bathrooms and improving disability accessibility to all buildings, while Cilento said she supported the creation of 50 wellness chairs trained by Counseling and Psychological Services to aid student groups and destigmatize mental health. Cilento said Medill sophomore Isabel Schwartz, who led the wellness chair campaign, worked with Syed and Baskaran but still wanted to implement the program if Cilento and Vinson won. “That’s something that Macs and I can both agree is a cool idea to implement, that if we were elected we would definitely work with Isabel to make that a reality and make sure she got the support for that program that she needed,” Cilento said. The debate was the last before voting begins at 5 p.m. Thursday.